This document compiles several monitoring tools designed for the Addressing Violence Against Women and Girls Through Sport (Kenya Timz) programme (see here for more details). They were developed by Itad, to support the programme in monitoring change on an ongoing basis, feeding into the logframe and the final evaluation. We have made these tools publically available for the use of other sport-for-development programmes, who may be grappling with similar challenges around how to measure change. Please feel free to use and adapt them. If you have any questions about the tools, please contact melanie.punton@itad.com. 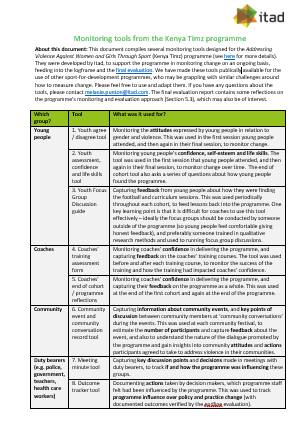 The final evaluation report contains some reflections on the programme’s monitoring and evaluation approach (Section 5.3), which may also be of interest.